Ultra Nitro Racers is a 3D racing game where you have to be always on top speed to win the championship races. To overcome the dispute, you can use a total of five different cars – released under get good positions in the ten races of the game. After finishing the championship, you can play on the tracks released or taken seriously and try to reach the record first. Depending on the road and the car used, high speeds can be an impracticable task. However, thanks to nitro, it is not necessary to worry about the sinuosity or the inclination of the way: just drive it to reach 200 km / hr in no time! I am no Gamer but I like Racing games so tried it for stress relief on a holiday. This is a light weight 3D game with just 32MB setup and so thought to share my views on this. In Ultra Nitro Racers, no need to worry about stopping in the pits to replenish the nitro, much less expect to be filled gradually over time. In this game, just go on one of several blue panels to ensure maximum speed recovery. Thus, there are roads on which it is possible to complete the three laps without end – obviously, driver skill is vital to maintain speed. Part of that skill is knowing how to make tighter turns without losing speed or hesitation, or you must have perfect control over the parking brake of the vehicle to turn or do not hit a curve arises. Besides, we also need to get preview problem situations – for example, during the start, all trigger the nitro and there is a sharp turn later. Result? A cluttered car. Solution: long last, to pass unharmed through the confusion and take the top spot. 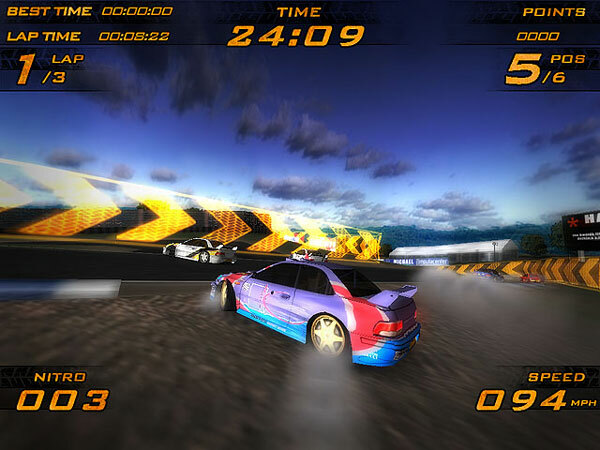 This game features the championship mode, which disputes a total of ten races. However, they are not exactly different between them: half are original, the other half is composed of five roads in the path of the original investment. Some roads are more difficult than others, though that varies according to the pilot’s familiarity with the use of the parking brake: a show several sharp turns and few opportunities to use the nitro as you challenge others have completely endless with sudden curves angle. In addition to championship mode there is also Time attack. In the first you can play in a career without the commitment to overcome it to get points for the tournament. On the other hand, in the second dispute against your own time. The Ultra Nitro Racers graphics are good and have effects that leave the screen blur to give the effect of speed. However, due to the size of the game, not the best on the market. Gameplay takes time to adapt, but it is not difficult – as there is no way to alter the difficulty of opponents, it takes a bit to be possible to overcome certain routes. The songs played during each race are quite animated and combined with the climate of adrenaline proposed by the frequent use of nitro. Although it is rather short and repetitive scenarios holds (with the path taken), the difficulty will ensure that less experienced players hours of fun.